Developer Quote: "Create calendar events using natural language in SECONDS, and seamlessly sync those events to your phone's calendars! (Exchange, Google, iCal, whatever!)" You probably use a few different calendars all of which you must read to get the facts on your busy weeks ahead. You can't afford to miss one event, and you don't have time to make a big job of a calendar entry. 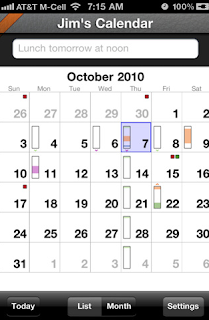 You don't require fancy backgrounds, fonts or interface, just a solid and functional calendar. So have you tried using QuickCal Mobile? Simply type for a few seconds and QuickCal will intuitively gauge the gist of what you are trying to input. What's more, QuickCal supports "Smart Reminders", which will create alarms at configurable time intervals. For example if you have a soccer game tomorrow, it will set a reminder 15 minutes in advance. Perhaps you may have an important staff meeting in 3 months? You will then be reminded a few days in advance. This is truly a quick and no-fuss way to create calendar events which, by the way, sync with your Google, Exchange and MobileMe calendars on your phone. 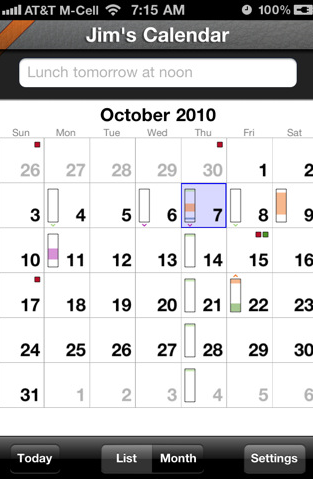 Utilize a handy view of upcoming events, as well as pinch and zoom to provide different levels of detail on your entries. Use one-click dialing to make your conference calls. All the things you need to know are in one spot in the palm of your hands. COOL CONCLUSION: "The ease and functionality of QuickCal Mobile will make this handy app a cinch for your daily calendar needs."